When: This past weekend. Left early on Friday, drove ten and a half hours (darn traffic!) and returned late Sunday. Supplies: Mini Oreos, Twizzlers, Cheetos. Lots of CDs. Why: To visit son #1 at his new home: Fort Bragg. And to meet his new fiancee. That's right-- son #1 is getting married! No idea when, but the proposal happened a few weeks ago, and we were thrilled to get to meet our future daughter-in-law (so strange to say that! ), who is also a soldier. They're very cute together and very happy. Was able to actually go inside the barracks and see his room--great to put a visual to where he's living now. Cannot believe how big Fort Bragg is. It has three zip codes! Huge. Just huge. It was a quick trip, but we had tons of fun. It's always great to have the whole family together--something I never ever take for granted anymore. And even though the rides were long, those are times to cherish, too. Even when stuck in (darn) traffic. It's going to be a busy week--I'm working on the first Love Potion Shop mystery, trying to tackle some home projects that I've been putting off, also working on the print version of Trouble Under the Tree (coming soon! ), and I WILL dig a book out of my TBR pile and lose myself in it (it's been much too long). Wishing you all a wonderful week! What are you reading? Have anything to recommend to me? Congratulations to your son on his engagement! I finished Perfectly Matched this weekend and absolutely LOVED it! The ending surprised me and I hope there will be more coming. I can't wait for the first Love Potion Shop and am waiting for the new release in August too. As for me, right now I am reading Think Twice by Lisa Scottoline. It is very good so far and I have a couple other books of her's in my TBR pile. After that I'm going to keep working through Victoria Laurie's Psychic Eye series. I've read the first two and have many more to read. I'll have tons of reading time over the next few weeks as I am having surgery on Thursday & will be on bed rest for a while. It won't be too bad as long as I have books to keep me company! Take care & have a great week! Keep us posted on your projects too. also read victoria lauries ghost hunter series, you won't be disappointed. I do not support this union. I'm saving Perfectly Matched for an upcoming vacation. Pool, fruity drink, chicken tenders and Lucy. That's my plan. I am getting ready to start A Darker Shade of Midnight by Lynn Emery. Have a great day and feel the love. Congratulations on your son engagement how exciting! I have not read perfectly matched yet, I don't have an ear eaters have to wait for print. I did just finished lisa lutz ,trail of the spellmans. and I am getting ready to start black night by christina henry. Currently I am reading Because You're Mine by Lisa Kleypas and Scandalous Desires by Elizabeth Hoyt. Thanks, everyone for son #1's well wishes--I'll pass them on. Breaunna, good luck with the surgery--hoping all goes well. Lisa S. books scare the bejeebers out of me, but I can't help but read them! LOL. Carrie, I *adore* the Spellman series. She can't write those fast enough for me! Azucena, I love Lisa Kleypas' books. Might have to read one of hers--it's been a while since I've read a romance. Sounds perfect. 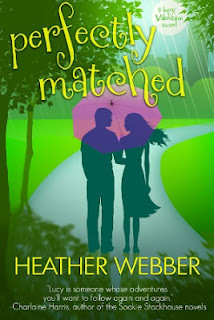 Perfectly Matched is perfectly wonderful!! !